With recent amendments, Connecticut has changed its Banking Law, increasing the areas of authority that the state Banking Commissioner has. Substitute House Bill 5490 changes the mortgage broker bond requirements for a number of mortgage and credit professionals in a way that allows the Commissioner to bring bond claims in certain cases. The bill makes a couple of procedural changes as well. The changes were signed by Connecticut Governor Dannel Malloy into Public Act No. 18-173 on June 14th, 2018. The dates on which the various provisions come into force are from July 1, 2018 to July 1, 2019 for the different sections. You can find the most important points from the new legislation below. 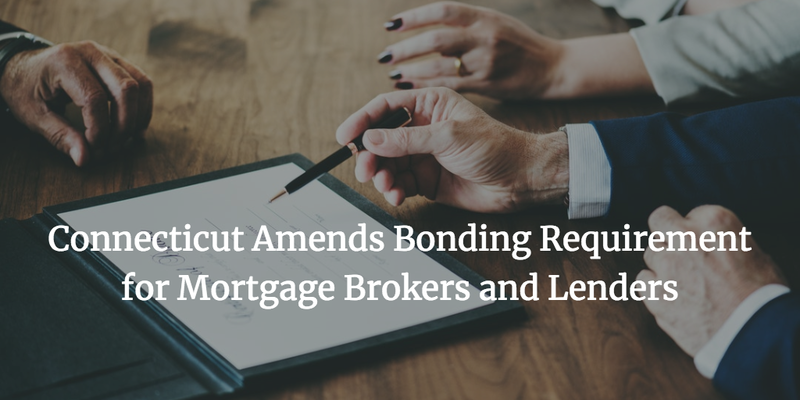 Until now, the Connecticut Banking law did allow consumers and the Banking Commissioner to make claims on mortgage broker bonds. However, the amendments expand the types of claims that the Commissioner can bring against mortgage professionals violating the law. Licensees now have to comply with the new requirements which are set in the bonding agreements signed when getting bonded. For consumer collection agencies, the previous version of the law allowed the Commissioner to make claims for civil penalties and unpaid examination costs for licensees subject to an exam. The amendments allow making claims for restitution for a law violation as well. In addition to the bonding requirements, House Bill 5490 also expands the investigation powers of the Commission, as well as other licensing rules and annual assessment. The license bonds for mortgage lenders, correspondent lenders and brokers, money transmitters, debt adjusters, debt negotiators, mortgage servicers, and consumer collection agencies can now be cancelled via an electronic notice in the Nationwide Mortgage Licensing System and Registry (NMLS) with a thirty days notice. The bonding amount that Connecticut mortgage brokers are required to post in order to get licensed is $50,000. For mortgage lenders and correspondents, the requirement is $100,000. The bond amounts cover all mortgage loan originators sponsored by the licensees. Getting bonded does not entail covering the whole required amount. Instead, you only have to pay a small percentage of it, called the bond premium. The surety bond cost you end up paying will depend on the strength of your personal and business finances. Among the most important factors that affect the price is your personal credit score as the business owner. Other key indicators are your business financials, as well as the liquidity at hand or assets you may be able to showcase. By examining these factors, your surety assesses the bonding risk involved. The lower it is, the smaller your bond premium will be. Would you like to learn more about how to meet your Connecticut mortgage broker and lender bond requirements? You can always reach out to our bonding experts at 877.514.5146.